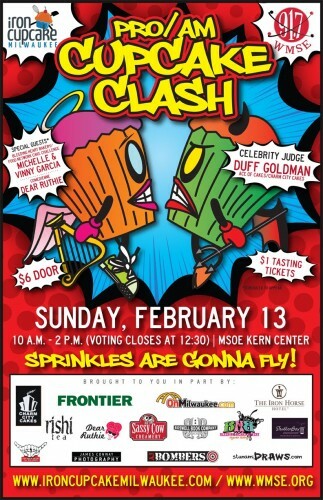 On Sunday, February 13th I will be competing as an amateur in IronCupcake: Milwaukee’s Cupcake Clash. War never tasted so good. You can attend the event for $6 and taste all the cupcakes your little heart desires for $1 (each cupcake). The $1 price of a taste also includes a vote for the Best Cupcake awards (Pro, Amateur, Overall). The best part (besides my baking, that is)? Duff Goldman from Ace of Cakes will be the celebrity guest judge! It’s a great event for the whole family – bring the kids, eat some cupcakes, but don’t be surprised that my recipe includes something boozy. This is me, after all. This entry was posted in CCC Updates and tagged Ace of Cakes, Duff Goldman, IronCupcake Milwaukee. Bookmark the permalink.